Thanks for the beautiful pics.. 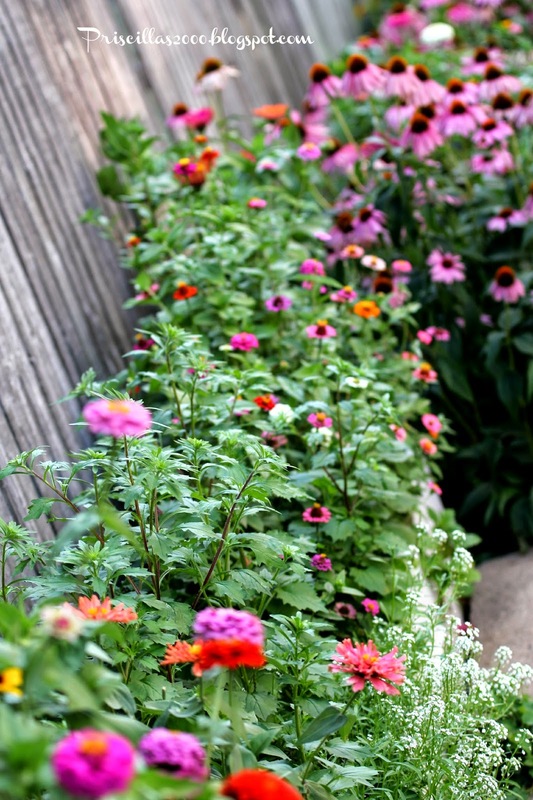 I am so going to plant zinnia's next year..I love them! I have decided i am going to plant a row of them in my garden..and sunflowers too. Have a great day! Blessings! 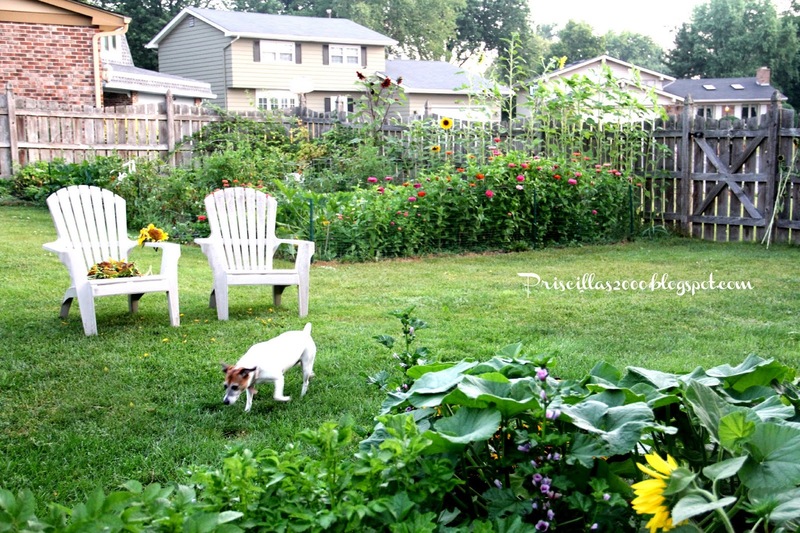 I am in love with your garden, Priscilla! 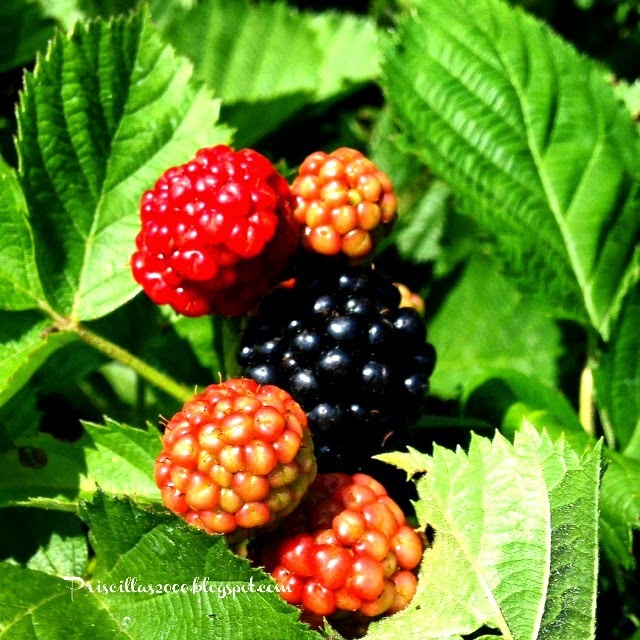 How delightful to walk through, cut some flowers for a bouquet, when those berries are ripe, pick some for a pie, wow, what makes life special all happening right here in your own backyard..
What beautiful shots of your bursting garden of color Priscilla! 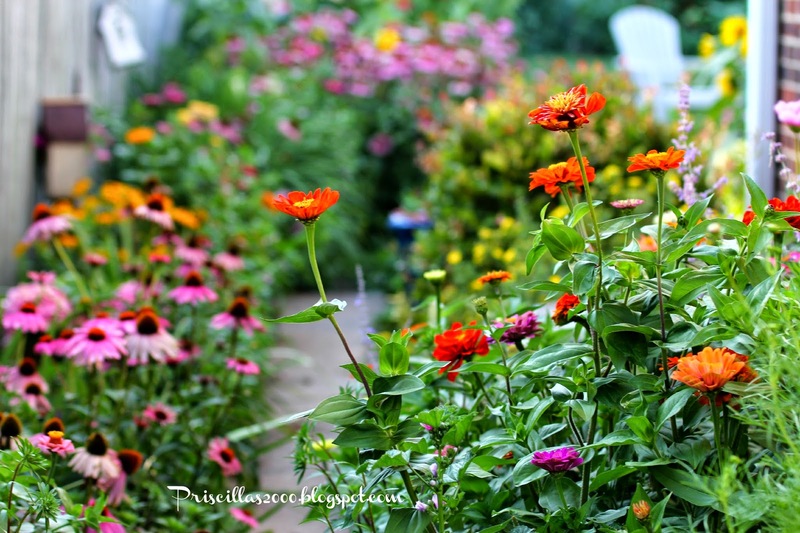 I wish I had planted more zinnias! I have just one patch, and they are really profuse. 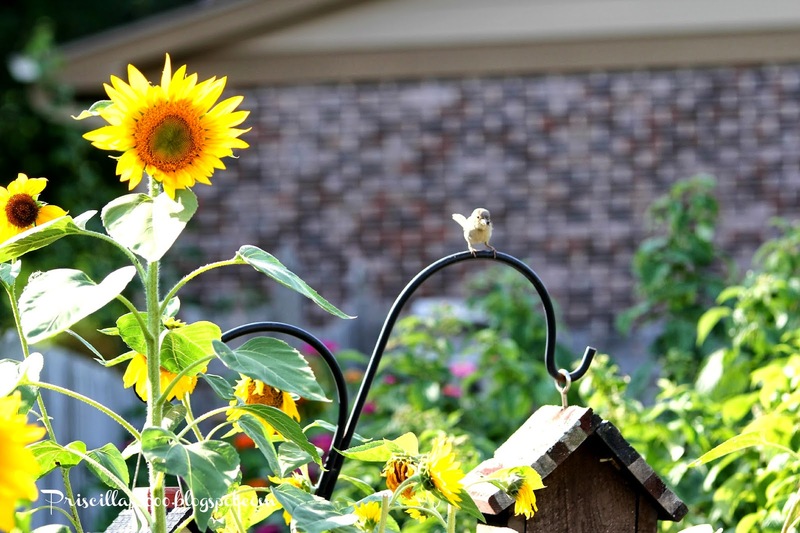 Love your shots with the finch and sunflowers! LOVE!! 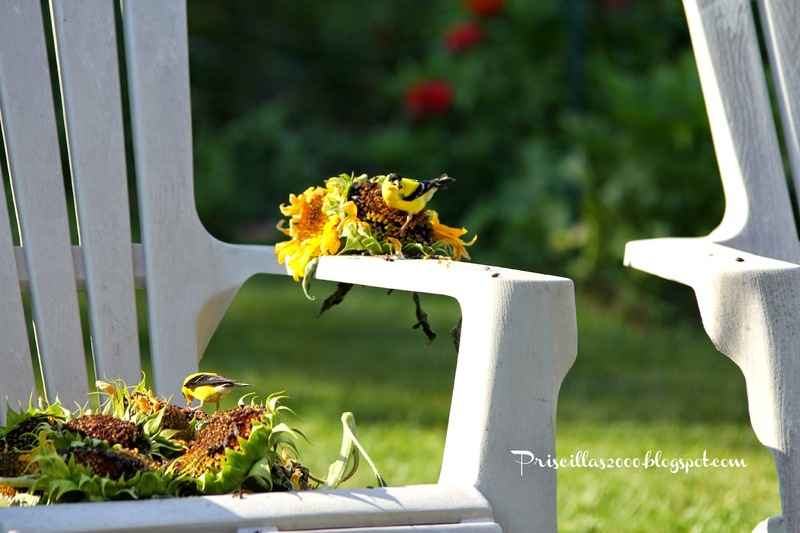 Your garden and your photography are both amazing. That cone flower shot could win a prize!!! 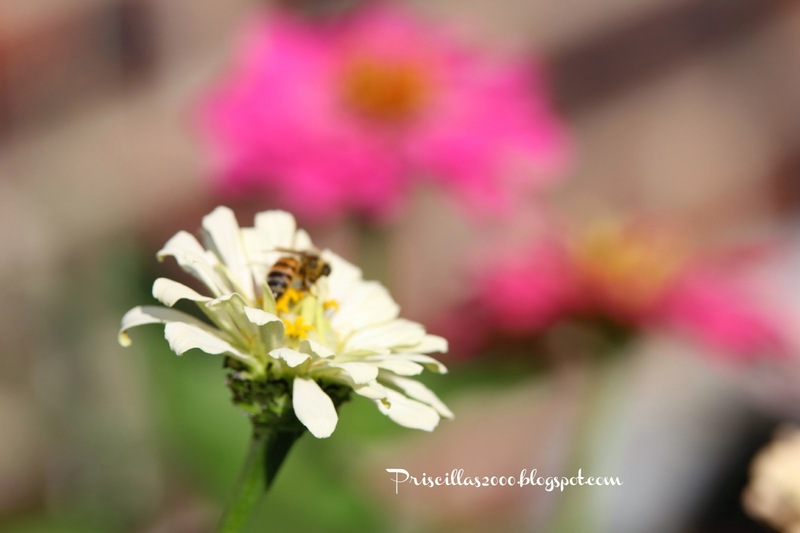 Love your flowers. My mother always grew zinnias and they say summer to me. Wish I had enough sun to grow them. Your garden is so striking and seems so happy. 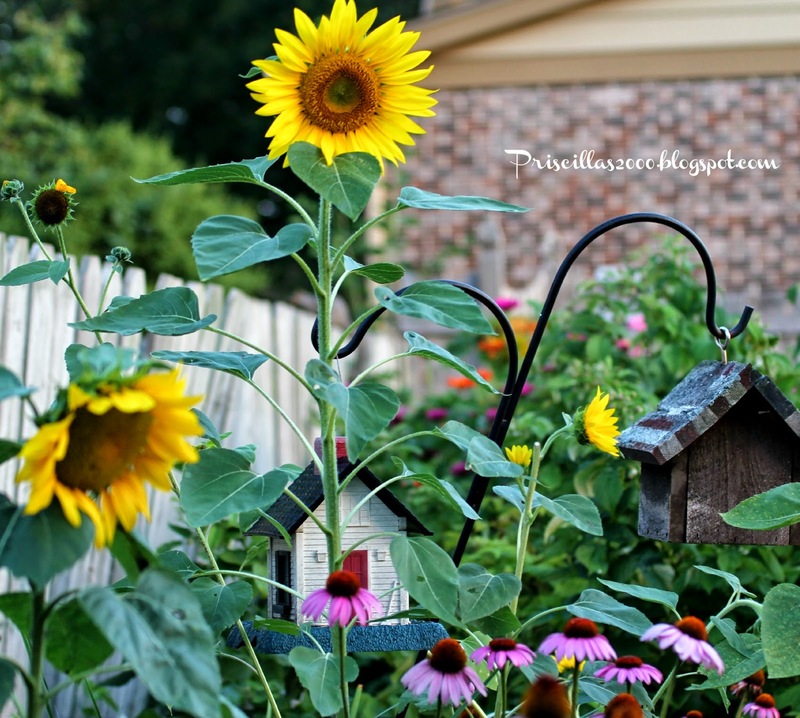 Your sunflowers are pretty too. Interesting that you are growing pumpkins in a pot. Have you had luck with that? I would be very interested in trying that. Wow, your photos are so, so pretty. 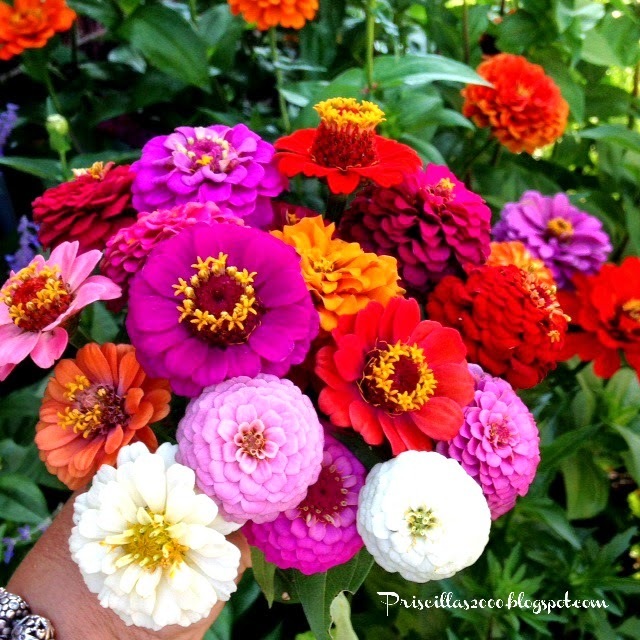 And I LOVE zinnias with all my heart. You've got a whole slug of 'em! They're such a happy flower. 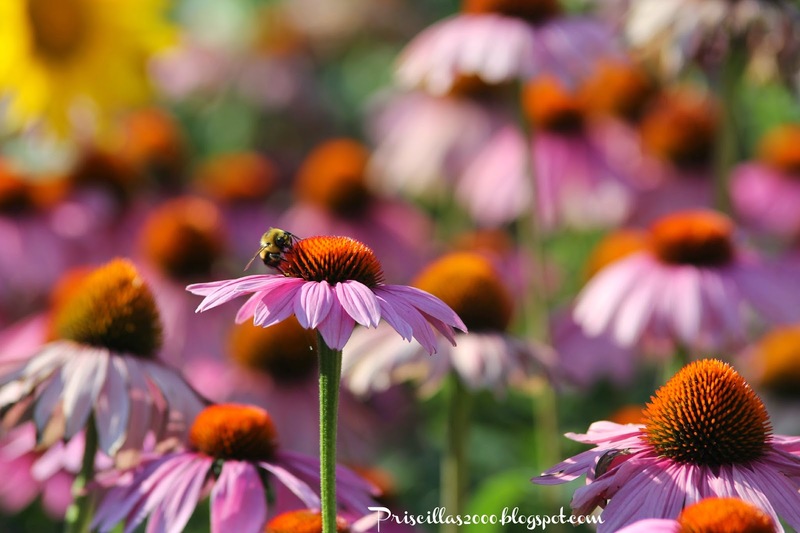 The echinacea is so pretty, as well. So glad I came by. 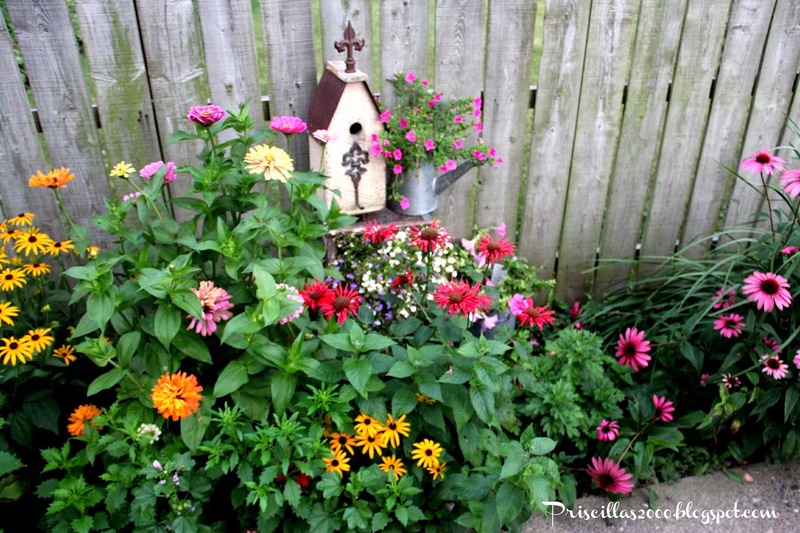 Next year I MUST plant some zinnias! So very pretty. 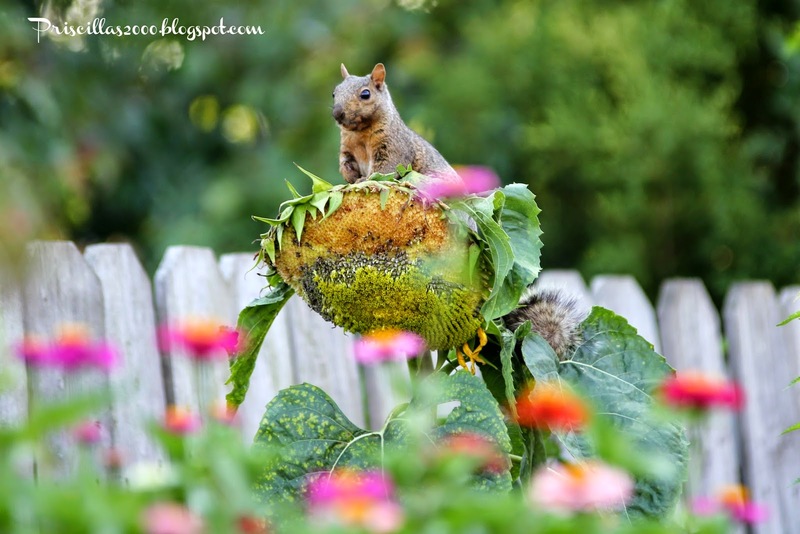 Love the squirrel too. gorgeous! and great shot of the hummingbird. 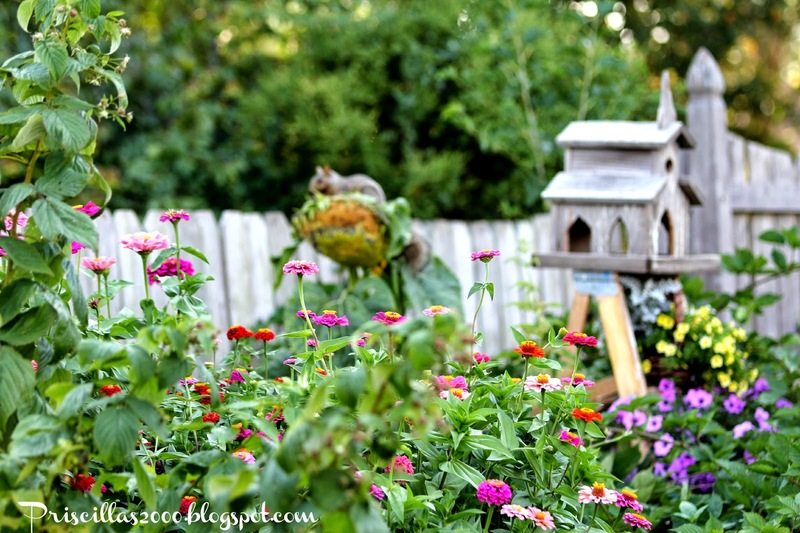 Summer is fading fast, and the flowers are looking a bit sad here in Northern Illinois. 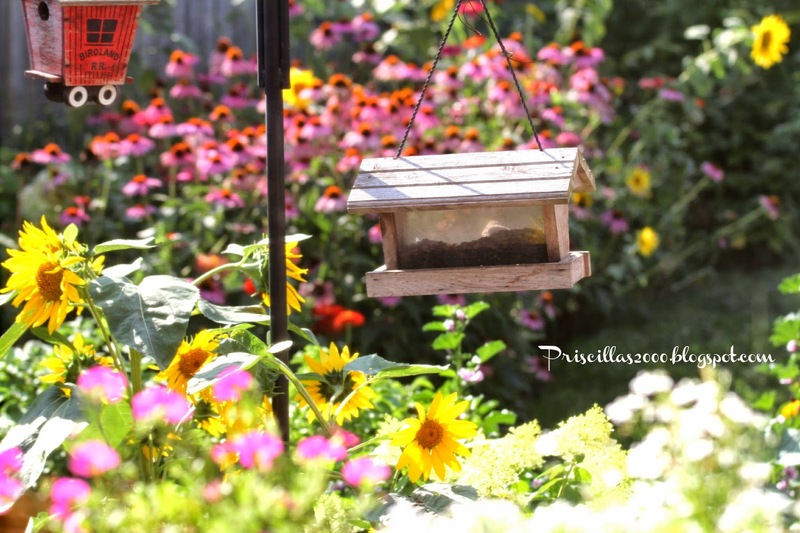 Your garden certainly looks beautiful. I guess I should not complain as the Illinois corn and soybean crops are amazing. As I drive down some roads the corn must be 8 feet high. Beautiful Priscilla! I love Zinnias. I planted a few, but next year I am going to do lots more. They are such a gorgeous flower! 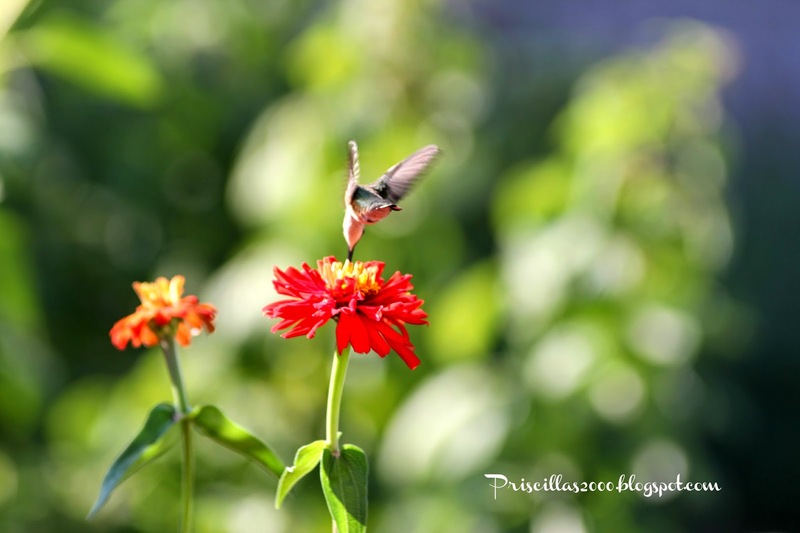 I remember a couple years ago running around the garden to get a perfect shot of a humming bird. Managed to get it. lol! Your photos are beautiful!! Thanks for sharing with SYC.